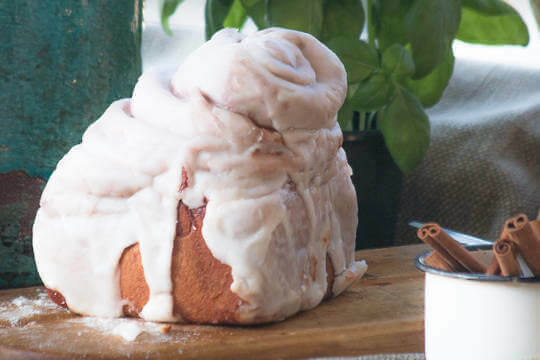 This “sinful” roll is your classic cinnamon roll times 10! Your eyes will pop when you see this 1 lb. roll completely covered with homemade icing. Definitely not intended for one serving, but you will be forgiven if you devour it all at once! To ensure freshness, we only ship on Monday, Tuesday, and Wednesday. Orders placed on or after Wednesday will be held and shipped the following week. View our Shipping FAQs for more information. Order online and pick it up free. Pick-up orders are due by noon Monday through Friday for pick up the next business day at 11:30 am in our Foyer. Contains: Wheat, Soy, Dairy, Eggs. Manufactured in a facility that processes other products which may contain soy, dairy, wheat, tree nuts, peanuts, and eggs.